The RUBBERSOID II construction method is hot applied asphalt bonding sheet type deck slab waterproofing construction method. 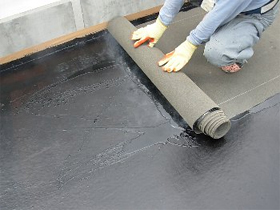 After applying “CATICOAT” on top of the concrete deck slabs or steel deck plates as the primer, spread the binding asphalt “GUMPHALT B”, and affix the “RUBBERSOID II” waterproofing sheet on top. This method conforms to the standard quality of the sheet-based deck slab waterproofing (hot applied asphalt binding type, heat welding type, and cold applied self-adhesion type) of the “Bridge Deck Slab Waterproofing Handbook”. As the sheet has both appropriate flexibility and strength, it adapts easily to the substrate to realize favorable implementation. The sheet closely adapts to the behavior of the deck slabs.